This is my easy, all-purpose stir fry recipe you can adapt to whatever protein and vegetables you have available. Instead of tofu, experiment with tempeh or a plant-based meat from Upton’s Naturals, Beyond Meat, Gardein or Tofurky. For veggies, swap in steamed broccoli, different types of mushrooms, daikon, bok choy or other leafy greens. Just be sure to add the vegetables with longer cooking times to the pan first. Finally, try this vegetable stir fry with wheat or rice noodles instead of rice, if you like. In a small bowl, combine cornstarch with 2 tablespoons water. Stir well and set aside. In a medium bowl, combine vegetable stock, soy sauce, rice vinegar, agave nectar and sesame oil. Set aside. In a large sauté pan, heat vegetable oil and spread so that it coats the entire pan. 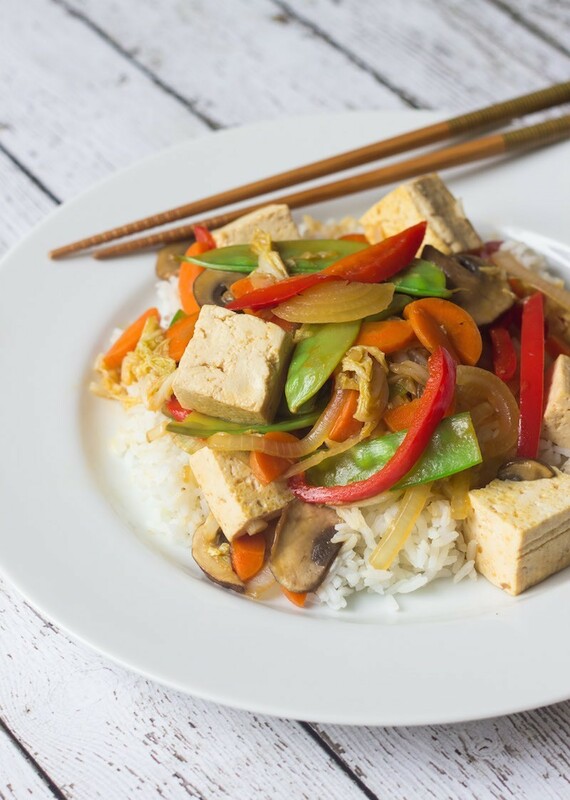 Place tofu cubes in oil and let sit, cooking 3-4 minutes until golden brown. Flip tofu over and cook another 3 minutes. Remove tofu from the pan and set aside. Add onion, garlic and ginger to the same pan that had the tofu. Cook about 1 minute. Stir in carrots and mushrooms and cook 3-4 minutes. Stir in bell pepper, snow peas and cabbage and cook 3-4 minutes. Stir the cornstarch mixture and add it to the vegetable stock mixture. Stir well and add to the vegetables. Continue cooking so that the sauce starts to boil and thicken, about 5 minutes. Gently stir in tofu cubes so they are coated in sauce.